Church Discipline is urgently needed in today’s churches. Most conservative leaders agree: a church cannot be Biblical unless it has a healthy practice of church discipline. The sinner’s restoration is the motivation; the church’s protection is the necessity when restoration fails. With thorough exegesis and scholarly authority, Owen exhorts the church in Biblical understanding and practice of Matthew 18:15-20. The power of the church towards its members (for it hath nothing to do with them that are without) may be referred unto three heads: 1. The admission of members into its society. 2. The rule and edification of them that belong unto it. 3. The exclusion out of its society of such as obstinately refuse to live and walk according unto the laws and rules of it. These things belong essentially and inseparably unto every free society and are comprehensive of all church-power whatever. The second of these hath been treated of in the discourse concerning church offices and rule; and all that belongs unto the first of them is fully declared in the chapters of the essential constituent parts of Gospel churches, namely, their matter and form. The third must be now spoken unto, which is the power of excommunication. John Owen (1616-1683) was born to Puritan parents in the Oxfordshire village of Stadham, England. He was a chaplain in the army of Oliver Cromwell and vice-chancellor of Oxford University, but most of his life he served as a minister in congregational churches. 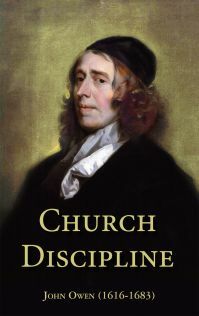 He is known as “The Prince of the Puritans.” His written works span forty years and run to twenty-four volumes representing among the best resources for theology in the English language.